Chewing tradition is very popular in society live all over country Chewing tradition usually uses by old man or woman (both) Chewing potions ingredent of tobbaco, cholk, gambir and piper betle leaves The wood, silver and brass is a metrials to made a place for Pakinangan. Commonly Java traditional house was completed with three rooms The middle room is usually empty. This middle room called petanen for Goddess Sri (Dewi Sri). For the peoples, a creese beside as a weapon also ability as a heritage. Because they thought that creese is made by a Master of Creese (called Mpu). The body of creese is smooth or waved (luk). The creese is also have complete with wraper. One of weapon that Java People count is the spear. 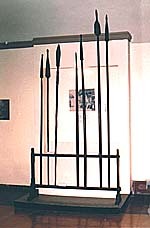 The spear made by Mpu. The material is from best metal and tin and it mixed and combined both.